Happy Feet DS is based on the Australian blockbuster hit of the same name that is currently gracing our cinemas and if you’re up for an entertaining and extremely cute CGI movie about dancing and penguins, then I recommend that you see this movie. The story of Happy Feet is about a young Emperor penguin called Mumble who is born without the ability to sing which may mean that Mumble will never find his soul mate. For in the world of Happy Feet that is loosely based on fact, penguins need to sing to find their mate. Fortunately for Mumble, his lack of song has made him a brilliant dancer that through his feet, he creates his own music. Happy Feet is not like your traditional platformer as the game is divided into two different game modes that include racing and rhythm. 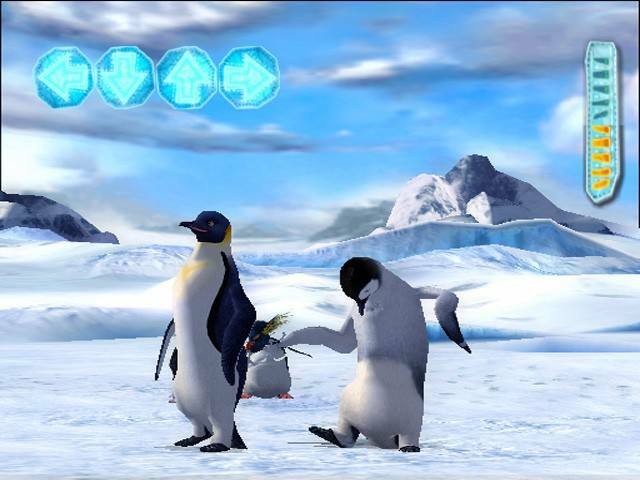 Fortunately both of these have been well executed with the rhythm section in particular becoming more difficult as the game progresses and as this is a touch screen game, you are challenged to tap various parts of the screen at the exact moment in order to maintain the penguin’s dance moves. Fortunately you have the choice of either playing this via the touch screen (great for the dancing games) or the standard controls for racing. The race section involves you sliding on your belly at great speeds downhill either against the clock or collecting items along the way that is also taken from the movie with Mumble and his fairy penguins sliding down enormous ice mountains. These game modes can also be played via single player or multiplayer. The control system of Happy Feet is quite apt, however with the inclusion of the stylus which is great for the rhythm games, the racing aspect is a little more difficult. Graphically, Happy Feet DS sports an impressive 3D graphic engine that is reminiscent of the movie and also contains sturdy framerates, sharp colours and also impressive dancing penguins. As you'd expect with a title based around singing and dancing the audio is spectacular and it includes five sampled tracks ranging from Stevie Wonder to actress Brittany Murphy’s rendition of Boogie Wonderland that sounds excruciatingly cute. 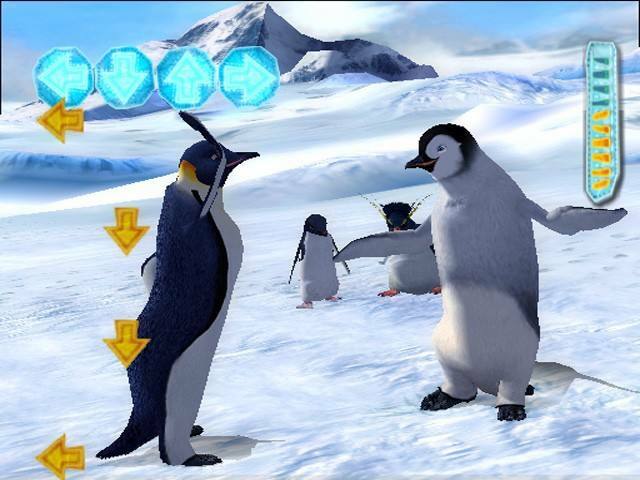 In conclusion, Happy Feet DS is an entertaining game that I would recommend for the younger gamers as for older games, it does become a little too repetitive. Featuring bits from the movie, Happy Feet also has some great graphics and music, unfortunately the gameplay and story is lacking.